Breakfast casserole. That's what Dan's googling found us (or whatever jiggerysearchery he did with his trusty iPhone) on our first day in the West Virginia area. It was just the place we wanted though. Aunty Someone'r'Other's cafe had a car park full of pickups, a client base who wore camo, cowboy boots and Nascar t-shirts. It also had a bubbly lady who was keen to let us know that their special breakfast casserole was, “real nice.” Naturally, we had to have it just so we knew what made casserole at breakfast time possible. This after all is a country where they confuse pork burgers with sausages. I'm not sure how to describe what was served but suffice to say, it was more baked goods than slow cooked. Nice but not overly filling. As Dan pointed out, it left room for lunch, a meal we had managed nicely without on the previous day. Set up for the morning, we headed out for Skyline Drive, a beautiful piece of road that travels through the Shanadoah National Park (and much more I believe). Actually, that's not true. First we went to Walmart, again, to get me more shades and some serious cold drugs as I had be hit pretty hard by Man Flu. 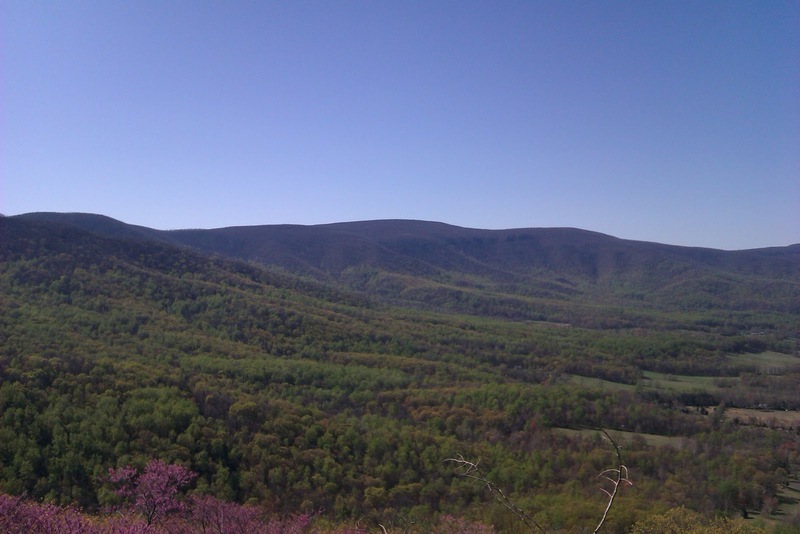 When we did hit Skyline Drive, the views were spectacular and the road surface was perfection its self. Not being prone to belting it about on motorcycles, I probably should have enjoyed it and did, for a while. However the monotonous 35mph speed limit, infrequent passing places and crawling sight seers made it somewhat dull. At the first exit onto the highway we left the park behind and pushed out to find our way about West Virginia. We rode around on roads that looked twisty on the map until we were ready for lunch. A sign promising fried chicken drew us into a petrol station where the lady clearly felt that Dan was some kind of idiot from the north as he tried to convince her that chicken wings are were in fact dark meat. Another lady told us that our proposed route was state maintained gravel road but then was a badly maintained track. Nobody was aware of anyone who had gone along it for years and that left me excited. I've seen far too many adventure motorcycle videos to let that go. It was a chance to see if a route was open and if Dan was up for it, I surely was too. As the road turned from gravelly tarmac to gravelly gavel, we stumbled across a man who seemed to be dutifully pushing around a wheelbarrow full of gravel. He hadn't gone along the road in two years and informed us there were two streams to cross and a car wouldn't do it but a truck could. 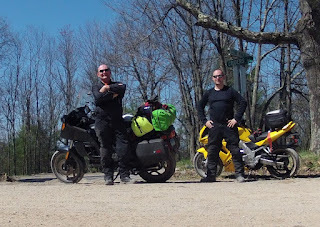 He paused, looked at our bikes, a sports bike and a tall, lumbering touring bike and said with complete authority, “Hay, but those bikes are practically dirt bikes aren't they. You'll be fine.” Once again, we smiled, trying not to laugh. As Dan later surmised later, he may believe that if it ain't a Harley, it's probably a dirt bike. And so our journey began. I enjoyed every minute and didn't find it that hard to keep the SV in check. The long ascent up the mountain was a piece of cake really. Following Dan, it was a lot of dust to ride though so I kept a good distance. 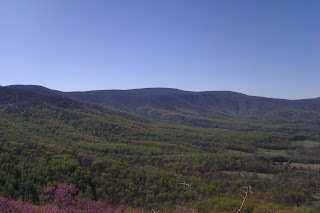 At the top I noticed a road sign declaring we had arrived at Cow Knob, a photo opportunity that could not be missed. Besides, as the tail end charlie, I needed to wet my whistle and clean the thick layer of dust from the Hero. People probably haven't gone down that route because their map is marked, 'Here Be Dragons' (or foreigners or unionists or worst). Dirt track roads are worth it, especially if you're on the lead bike. We soon found our way back to the road and oh what a road it turned out to be. We had pitched up on route 33 which is tremendous. We could finally give the bikes some real stick. The road threw corner after corner at us and before long, the last of the fuel was gone and we were seriously thirsty. 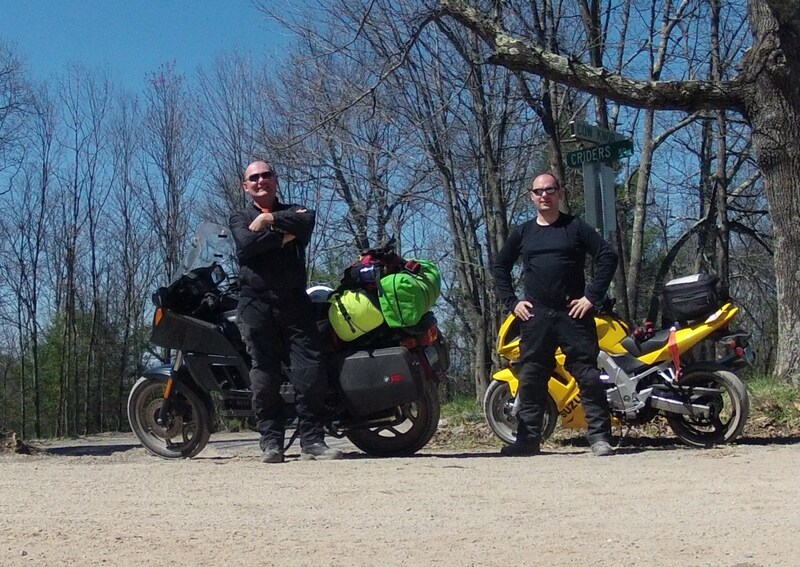 Once again, stopping, bumping into another biker pointed us in the right direction. We were just sitting down for a drink on the veranda of a gas station when an FJR pulled in. The owner grabbed an ice cream and we talked over the map. 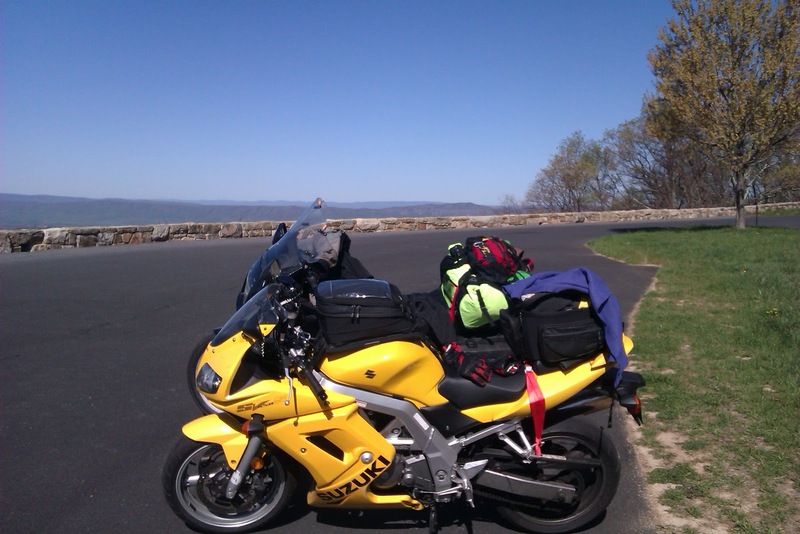 He wasn't local but kept a bike in West Virginia just so he could ride it around the same circuit. By the time he left we had a good idea of where we would be camping and where we would ride the next day. Oddly, the rest of the day was a sort of repeat. We somehow ended up back on a dirt track road but on different bikes this time, courtesy of my poor use of the GPS. When we eventually stopped to figure how we would reach the camp site, we discovered that; the back brake on the SV was shot and the left fork on the RT was leaking. None of it came as any real surprise and in both cases we could carry on with care. So that's what we did. Miles and miles of dirt track and with it's fair share of oncoming pickups kicking up dust and stones as the sun made it's way out of the picture. Finally, tarmac. We were so excited. I followed Dan in snaking the bike to clean the dust from the tyres, ready to ride them like they were meant. It was almost heart breaking when the tarmac ended again and we were back on potholes and gravel. Eventually, we did pitch up on roads and they were good. They took us through twist and turns to the state park at Canaan Valley where we pitched our tent and were directed to Big John's family restaurant for dinner. It was late and dinner, calzone, was somewhat insufficient so Dan got us the worlds biggest ice-creams to make sure we had the calories to get through the cold night ahead. Me, I rode off to find milk, to make tea, to get us through the cold night ahead. Somewhere between those measures and the extra layer of long-johns, I was much more comfortable and slept well ready for the very different but equally superb day's riding we had ahead. IT LOOKS AWESOME. WE HOPE YOU ARE REALLY LIVING IT UP! SEE YOU BOTH SOON.